If you’re anything like me, it doesn’t take you once to learn something. Nope, you’re the type of person that likes to repeat things, as painful as they may be, just to be sure you didn’t miss something the first time. I’ve finally come to consider myself a living, breathing paradox as I shy away from the typical adrenaline junkie faves like sky-diving and such, yet have seemingly no fear when it comes to jumping out of planes traversing the inner skies of the human psyche. In fact, I am sort of addicted to it. Ever since I can remember I always grasped the brilliance of “measure twice, cut once.” I could always appreciate the time and effort people put into things they loved and cared about; mostly because it showed. But not only in the effect of an outcome or product built, but all throughout the person’s being. Although I didn’t fully understand it at the time, and to this day still feel miles from fully grasping it entirely, when people are doing what they love, what they were born for and meant to do, if you look less with your eyes and more with your heart, you can literally see this fulfillment shine through one’s entire being. These types of people, whether fully conscious of it or not, have perhaps learned one of life’s hardest lessons and to me, that is to accept yourself. You see, if you think about how quickly or slowly we tend to learn and the overall quality of our lives, we can’t help but notice the connection. And perhaps this is entwined with our ability to accept what it and use it as a catalyst to create what can be. 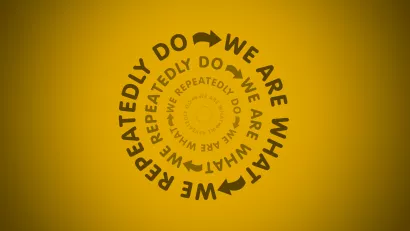 In my experience, personal or otherwise, it seems that those empowered with this connection, are either consciously or subconsciously breaking the cycle, the patterns we all end up forming, healthy or otherwise. They are instead living from what is commonly known as the “heart-space” and a little less to serve the “mind-space”. On some level, it’s as if they’ve tapped into the awareness that while technically “Mind” is the only thing that moves, it is US, the conscious creativity we each envelop when incarnating here on Earth whom initiate the push. It’s like being chained up your entire life only to finally realize the chains were never locked or attached to anything solid or stable. Inner freedom is perhaps the spark of the science behind our experiences. The freer we feel in our lives, in our choices, and the events going on around us, the more grounded we become in our understanding. Knowing that this freedom, which we are all born with and yet only some regain, would act to naturally give us a sense of controlled comfort, yet not unyielding to the possibility of suffrage or struggle. Not to say this acceptance or inner knowing doesn’t come with a nice side dish of fear, but rather than allowing said fear to barricade progress, it is used as a launch pad forward. And the fear eventually ceases because with this knowledge comes the foresight that you actually have a say in the direction in which your next move is fired and with how much ammunition. Such a simple yet misunderstood concept of learning is we only need to learn something as long as it takes us to accept we have learned it. We’ve all heard the power of belief and it is my own, that they are ever more powerful than we’ve ever been taught. They are both the lock and the key to our inner strength and when put into motion with intense positivity, cycles can not only be broken but forever collapsed into the foundation of one’s personal integrity. Previous Doing the Cosmic Dance; or, Who Goes into the Stillness?